By now, you’re probably very aware of the health benefits of quinoa, FYI, it’s pronounced keen-wah (here are some other food names you’ve probably been pronouncing wrong). The super-grain is high in protein, making it a great option if you want to try and lose weight fast in a healthy way, and is bursting with calcium, iron, fibre plus vitamins E and B. But how can you incorporate it into your diet? 1. Prepare the quinoa salad. Heat the oil in a frying pan to smoking point and add the mustard seeds. When they crackle, remove the pan from the heat and pour the oil and seeds into the quinoa. Add the remaining ingredients, mix together, adjust the seasoning and set aside. 2. Combine all the ingredients for the chickpea cakes. With wet hands, divide the mixture into 12 equal balls (they should each weigh about 30g) and flatten slightly. Heat enough oil for deep frying in a deep-fat fryer or a deep, heavy-based saucepan to 180°C. 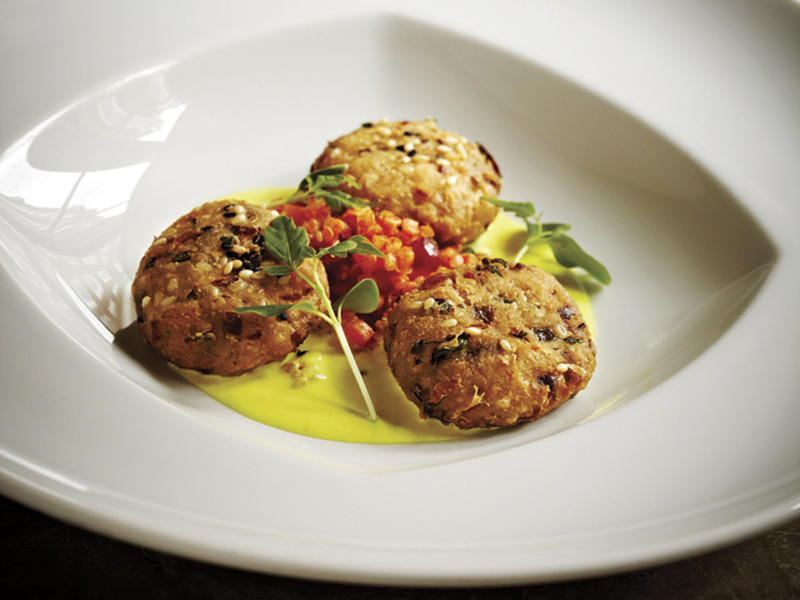 Add the chickpea cakes and deep-fry for 1–2 minutes, until crisp and golden brown. 3. Drain well on kitchen paper and serve immediately while still hot with the quinoa salad and curried yoghurt. This recipe has been provided by Vivek Singh, Executive Chef and CEO of The Cinnamon Club, Cinnamon Kitchen and Cinnamon Soho. 2. Soak the quinoa, drain and rinse. Cook in hot water or stock according to the packet instructions, approximately 10-15 minutes. Drain and set aside. 3. Quarter the fennel and slice the carrots lengthways on the angle – rub with coconut oil and roast for 8-10 minutes or until tender. 4. Toast the sesame seeds in a dry frying pan, remove and set aside. 5. In the same pan, dry fry the asparagus by laying out on the pan, not too close and let them dry fry and brown on a medium heat for 1-2 minutes on each side, depending on their thickness. 6. Prepare the dressing by blending all the ingredients or chopping everything finely and whisking with a fork or shaking in a jam jar. 7. Slice the radishes and spring onions. 8. Roughly chop the mint and coriander. 9. 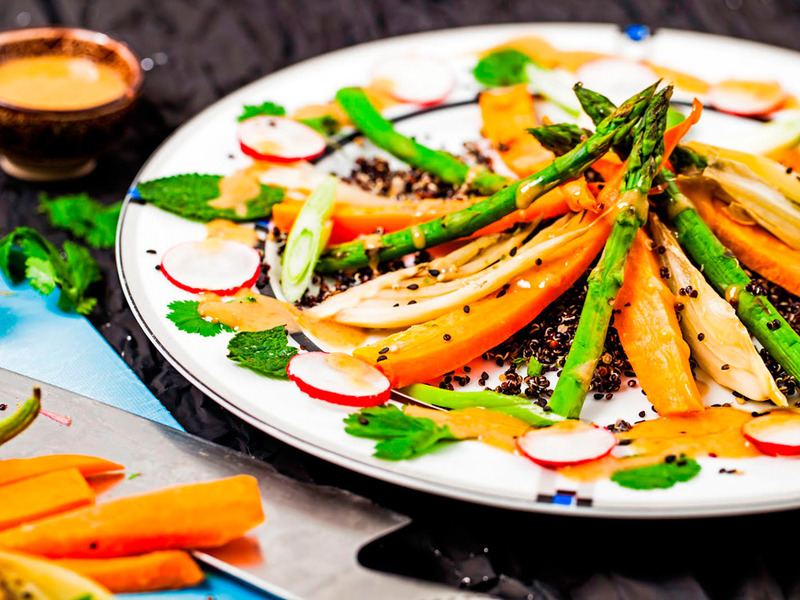 Spoon the quinoa into the centre of the plat and arrange the carrots, fennel and asparagus in the centre. Scatter the radishes, spring onions, herbs and toasted seeds around. 1. Boil the quinoa for 14 minutes, drain and immediately cool down with cold water. 2. Peel and thinly slice 50g of beetroot. 3. Peel and chop the rest of the beetroot into tiny squares. 4. Crumble up the goats’ cheese. 5. Finely chop the rocket salad. 6. Mix the two dressings together. 7. Mix all above ingredients except for the sliced beetroot together with the dressing, salt and pepper. 8. Squeeze the half lemon into the salad, mix. 9. Place the sliced beetroot flat around the plate. 10. Pile the pre-mixed salad on top. 1. Put the rinsed quinoa in a pan and add the water. Bring to the boil and then simmer for approximately 20 minutes until tender and the germ has sprung away from the grain in little spirals. Drain thoroughly, cover with a lid and allow to rest in the pan. 2. After five minutes tip the quinoa into a large salad bowl and break up with two forks to loosen, then stir in the Thai curry paste. Leave to cool, tossing occasionally. 3. Steam the sugar snap peas until just tender then refresh under cold running water to keep the green colour. Drain well and pat dry with some kitchen paper. 4. 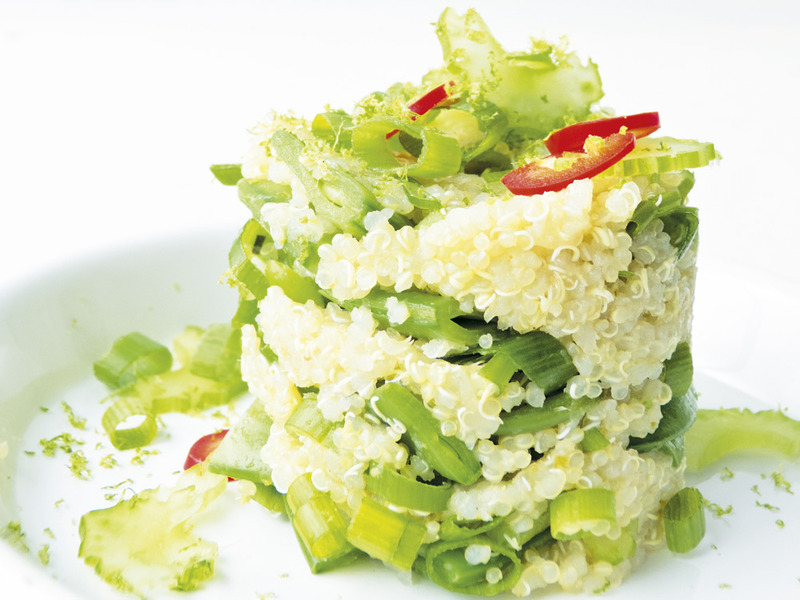 Stir all the green vegetables into the quinoa and add lime juice to taste. 5. 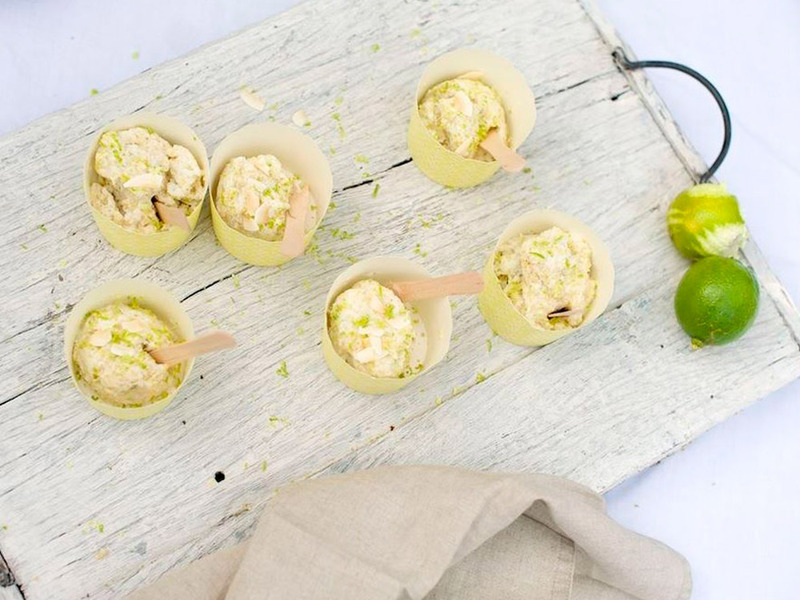 Serve decorated with a few slices of chilli, celery and lime zest and a tiny drizzle of olive oil. This recipe was taken from Traidcraft’s Bake A Difference cookbook. 1. Zest and juice the limes and heat in a pan with the sugar. 2. Pour into a bowl and mix in the coconut cream. Leave to cool. 3. Whip the cream, then stir in the coconut and lime mixture and quinoa. Freeze for an hour, whisk, then freeze again. Repeat the process. 1. Cook the quinoa in boiling water for 10mins or until just tender. In a separate pan of boiling water, cook the broccoli florets for 2 mins. 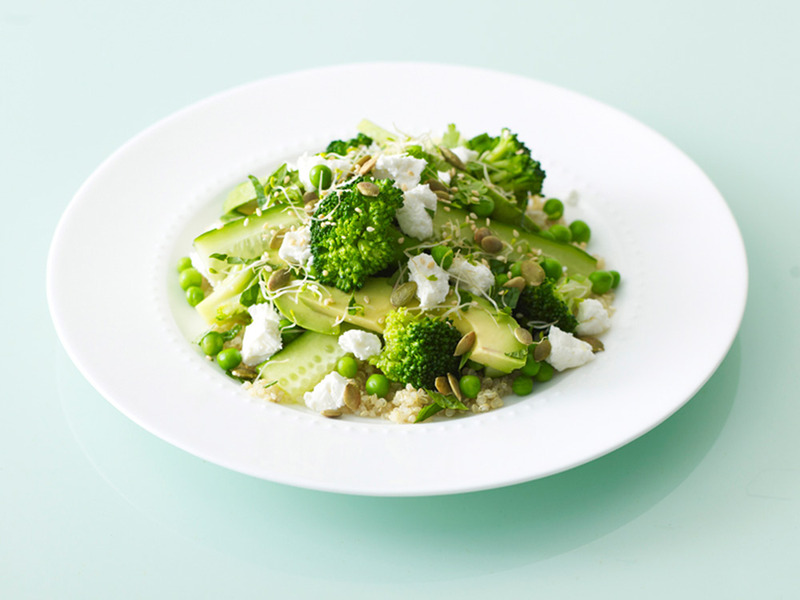 Drain the quinoa and broccoli in a large sieve and rinse in cold water until cold. Drain and transfer to a large bowl. 2. Add the oil, lemon zest and juice and seasoning to taste. Toast the hazelnuts under a medium grill, then roughly chop. 3. 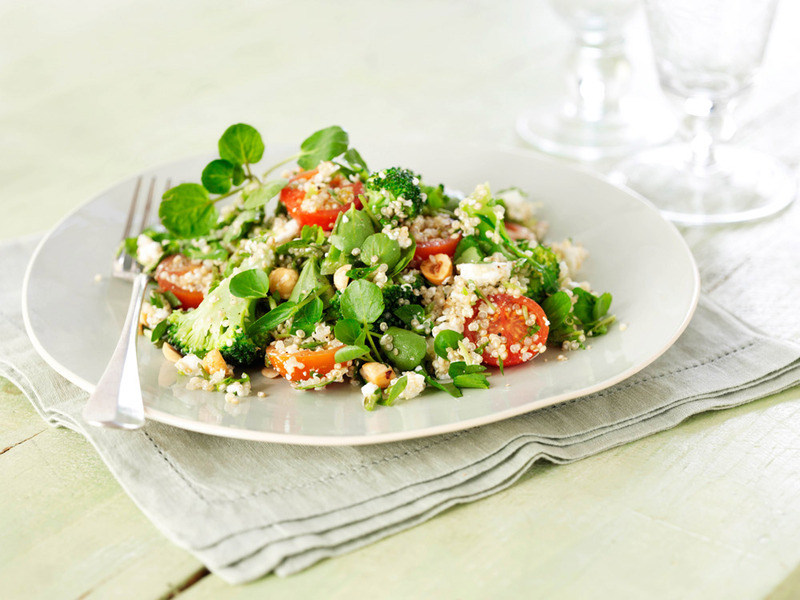 Roughly chop the watercress and add to the quinoa along with the hazelnuts, tomatoes, and feta cheese. Serve with more watercress leaves. 1. Peel and chop carrots and parsnips into neat slices. Remove outer leaves from brussels sprouts. Peel and slice red onions. Zest and juice oranges and soak cranberries in the juice until plump. Pick herbs and chop finely set aside. 2. Set oven to 200°C. Blanch carrots and parsnips in salted water for 3 minutes drain and refresh in cold water. Add the dried chili and 1 tbsp of olive oil, seasoned with salt and roast in a hot oven until coloured for about 5 minutes or until cooked through. Cool and set aside. 3. Blanch the sprouts for 3 minutes in salted water, refresh in cold water and cut in half. Dress them in 1 tbsp of olive oil, season and fry them in a non-stick frying pan until golden and slightly scorched. Remove and cool. 4. 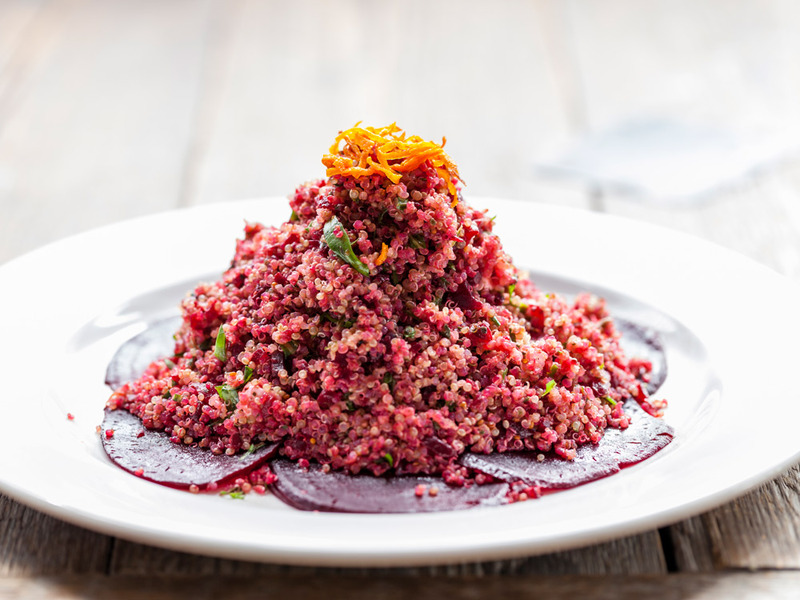 Cook the quinoa on the stove with water double the volume of quinoa and a pinch of salt on a low heat until water has absorbed and the quinoa is light and fluffy. 5. Whilst this is cooking fry the onions in the frying pan with the last tbsp of olive oil and sherry vinegar. Cook until soft and the vinegar and dispersed. Season. Toast flaked almonds in the oven until coloured – don’t scorch them or they will turn bitter. 6. Mix all the elements together in a large bowl add the lemon juice, parsley and chives. Adjust seasoning if required. Scatter with the toasted almonds and serve at room temperature with left over turkey or ham and good quality coleslaw. This recipe has been provided by Nick Selby, co-owner of Melrose and Morgan. 1. Preheat oven to 190°C/gas mark 6. 2. Rinse the quinoa very thoroughly in a sieve under running water. Put into a pan with 150ml of water, bring to the boil then simmer gently until all the water has gone and the quinoa is tender. 3. Cut the peppers in half vertically through the stem. Remove the seeds and any membranes and lay cut side up in an ovenproof dish. Drizzle with a little olive oil. Roast in the oven until just tender but not to the point of collapse. 4. While the peppers are roasting fry the onion and celery in the remaining oil until softened and beginning to turn golden around the edges. 5. 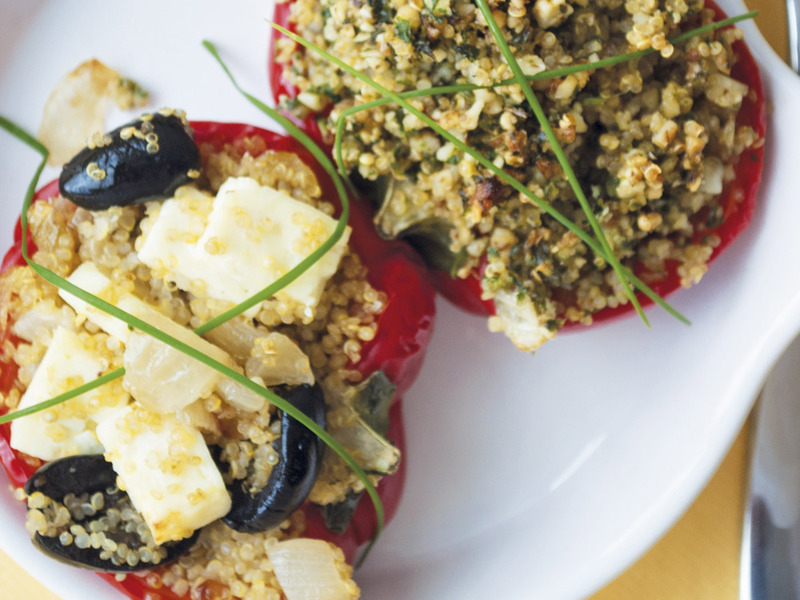 If using the Feta cheese and olives: add the onion mixture, Feta cheese, olives, parsley and seasoning to the quinoa and mix well then spoon into the pepper halves. 6. Add the onion mixture, pesto and seasoning to the quinoa and mix well, then spoon into the pepper halves. 7. Return the peppers to the oven and bake until the filling is piping hot and the tops are beginning to brown. 8. Garnish with chopped chives and serve with a crisp green salad. 1. 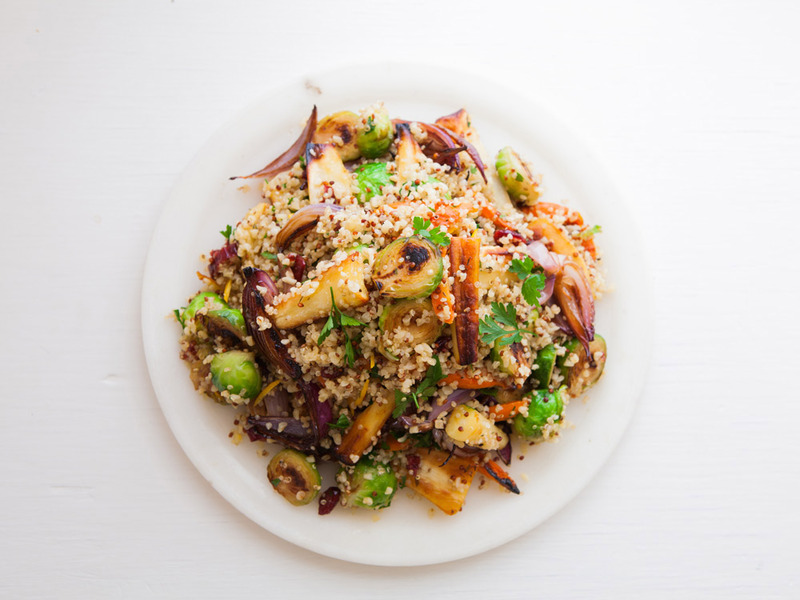 Cook the quinoa and set aside to cool down. 2. Toast the sunflower seeds on a medium heat in a dry pan until they start to brown then set aside. 3. Chop the spring onion, cucumber and radish finely and grate the carrot. 4. 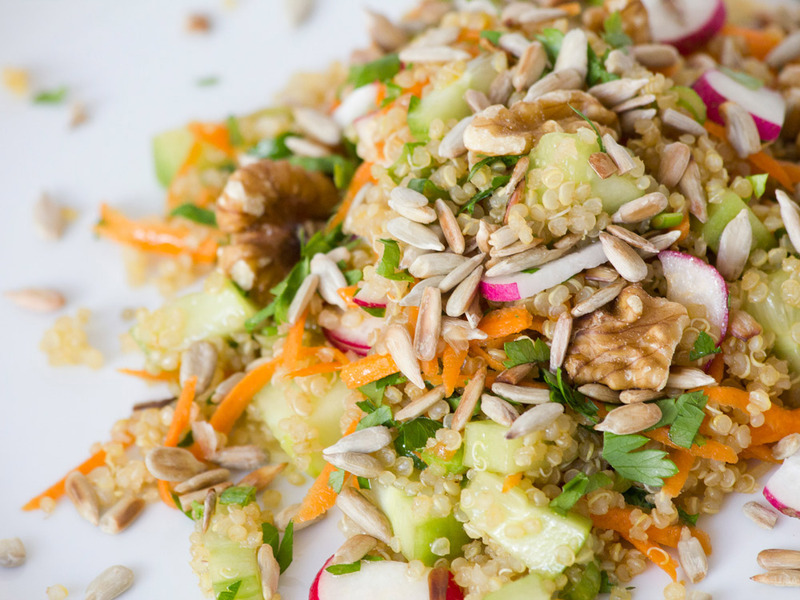 In a salad bowl, combine the quinoa, vegetables, seeds and nuts. 5. Whisk the dressing, add to the salad and mix. Top with parsley. 1. Rinse the quinoa, place in a small pan with a couple of cm cold water, bring to the boil then gently simmer until there is no water remaining and allow to cool. 2. Boil the broccoli and peas (unless using frozen) for about 3 minutes then run under cold water to cool. 3. Layer salad onto two plates as follows – quinoa, cucumber, broccoli, peas, feta, alfalfa, seeds, avocado and finally the parsley and mint. 4. Mix together the lemon juice, olive oil and seasoning to taste and dress the salad just before serving. 1. To prepare the marinade; in a large shallow non-metallic dish mix all the ingredients together. Place the cutlets or chops in the marinade mixture and coat well on both sides. Cover and refrigerate for 2 hours, or if time allows overnight. 2. Remove the cutlets or chops from the marinade (reserve the marinade) and cook on a prepared barbecue or under a preheated moderate grill for 6-8 minutes on each side. Meanwhile, heat the marinade in a small pan until piping hot and pour over the chops before serving. 3. 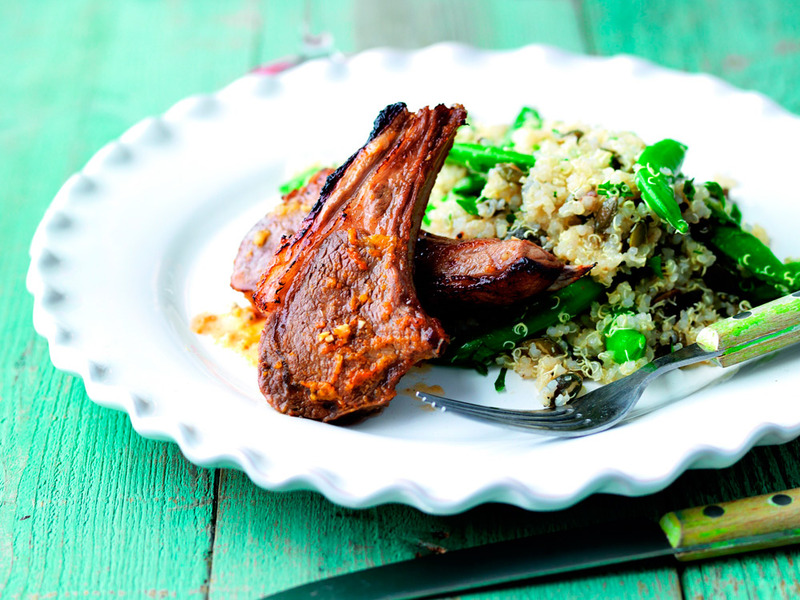 Serve the lamb with the quinoa and sugar snap pea salad. 1. Preheat the oven to 180°C or gas mark 5. 2. Lightly score the chicken. Drizzle with olive oil, season with salt and pepper and coat with the spices and herbs. 3. Place on top of foil in a pre-heated baking tray and bake for 25 minutes. 4. Whilst the chicken is in the oven cook the quinoa according the packet instructions adding the stock cube at the beginning (usually one part quinoa to two parts water, bring the boil and simmer for 15 minutes, cover with a lid until all the water has absorbed). When you bring the water to boil add the spinach and tomatoes. 5. Once the quinoa is cooked mix in the cajun spices (optional), crème fraiche and toasted seeds. 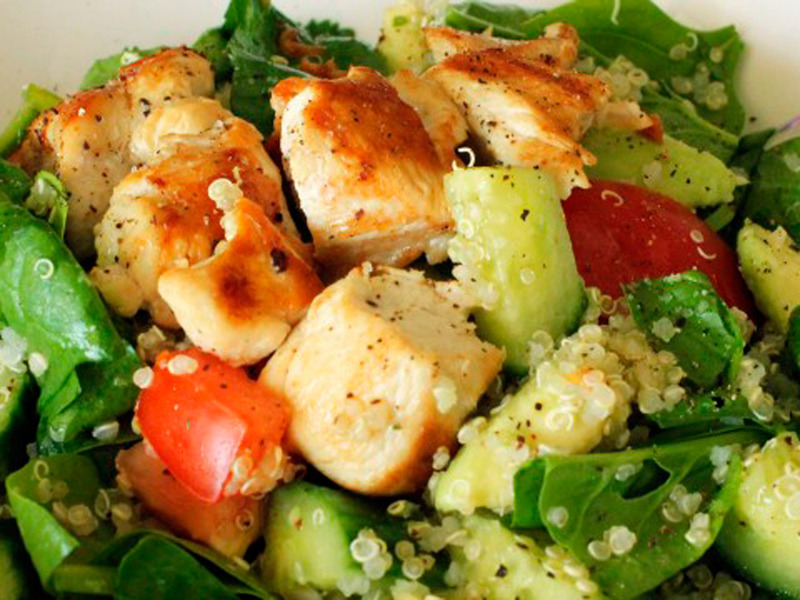 Top with the avocado and serve with the chicken. 1. Preheat the oven to 180°C (Gas mark 5) and smother the salmon with lemon juice, salt, pepper and a little chilli powder. Cover the fish in foil and bake it in the oven for roughly 12 minutes. 2. For the crust combine the nuts, coriander, chilli, agave nectar and olive oil. For an extra kick I would suggest a generous pinch of salt and black pepper. 3. 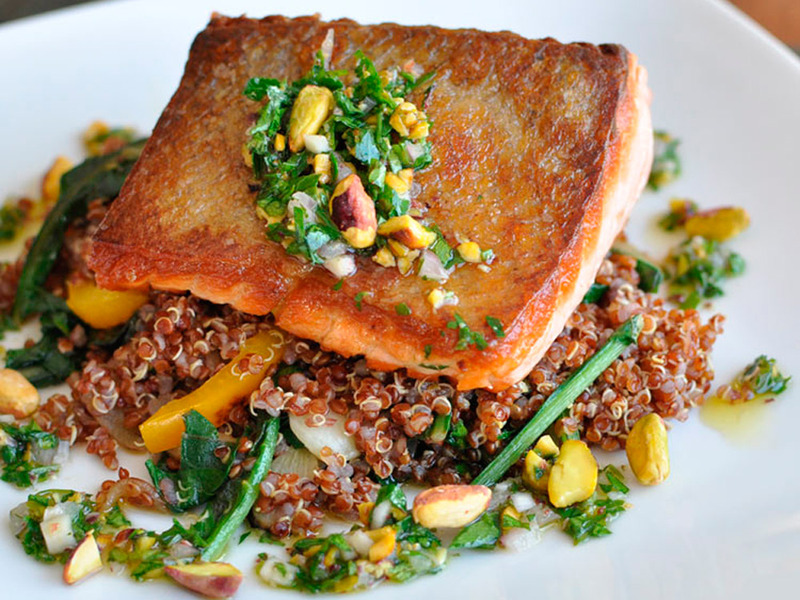 When the salmon is cooked spoon the nut mixture onto the top of the salmon and serve with the quinoa (you can put the nut mixture onto the salmon before you bake it in the oven though personally I find that this lessens the crunch of the nuts).